In the late summer of 2016, an interesting phenomenon was observed in Whatcom County, WA. People, with books balanced on their heads, performed feats ranging from archery, to flying a plane, to Tai Chi. They recorded videos of themselves and shared them online, challenging others to do the same. Others watched the videos, smiled, laughed, shared, and made videos of their own. Some of them even signed up for library cards. 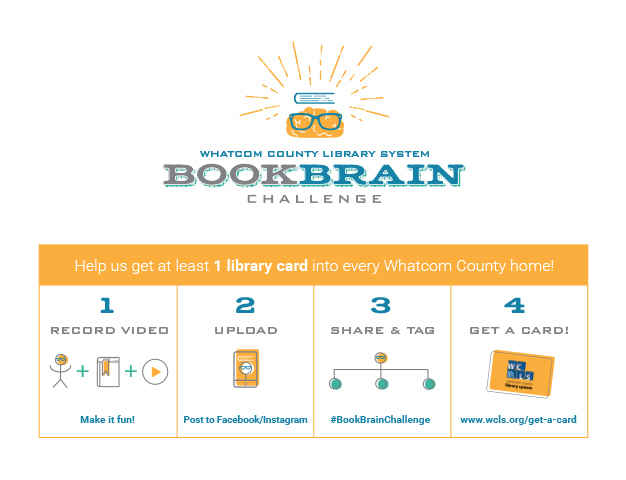 All of this was in support of the Whatcom County Library System’s “Book Brain Challenge“—a viral marketing campaign that helped WCLS break the record for most card sign-ups ever by 26%. Modeled after the very successful ALS Ice Bucket Challenge from 2014, the Book Brain Challenge was searched for and mentioned more than 80,000 times on Facebook, featured in the local paper, and involved local elected officials and community leaders. The campaign was part of the larger “My Modern Library” campaign, which more than doubled the library’s annual goals for cardholders and circulation. If you’re wondering if your library could pull this off, too, the answer is “yes.” By understanding why people share and engage with content, you, too, can create a viral library campaign. 1. To bring valuable, entertaining, and enlightening content to the lives of people they care about. 50% share to inform others about products and ideas they know the recipient is interested in, sometimes with the goal of changing their opinion or motivating them to act. 2. To define themselves. 68% share to define themselves; this is both to others and to themselves. 3. To grow and nourish their relationships. 80% share information with others as a means of staying connected when they wouldn’t otherwise keep in touch. Seventy-three percent share content online to help them connect with others who share their interests (i.e. community building). 4. Self-fulfillment. 69% share information because it allows them to feel more involved in the world. 5. To get the word out about causes they believe in. 84% share because it is a way to support causes or issues they care about. 1. It was easily shareable: people could participate online with a click and tag others to do the same. 2. Easy to do: come up with a weird flavor, post it to Facebook, and you’re done. 3. Has an emotional benefit/cause: how cool would it be to have your flavor chosen? 4. Offers an incentive for sharing: $1 million prize sounds pretty fair to us. 5. Leaves room for creativity: participants could post whatever flavor they wanted (Chicken and Waffles, Siracha, and Cheesy Garlic Bread ended up being the finalists). With the Book Brain Challenge, we encouraged local citizens to show off a skill, talent, creative idea, and/or part of their own life which allowed each individual (or group) to put their own spin on the challenge. We planted a number of videos and asked library staff, elected officials, and other community leaders to participate, which allowed us to make a big splash at launch-time and prompted other people to participate. The campaign was successful because it was: easy, fun, for a good cause, invited people to participate, and was inclusive of everyone. What’s A #Hashtag, How Does It Work, And Why Should You Use One? A hashtag is a metadata tag used on social networks to make it easier to find content with a specific theme. While the hashtag or “pound” sign has been in IT systems since the 1970s, it became popularized in its current form by users of IRC chat networks to allow the labeling of both groups and topics. 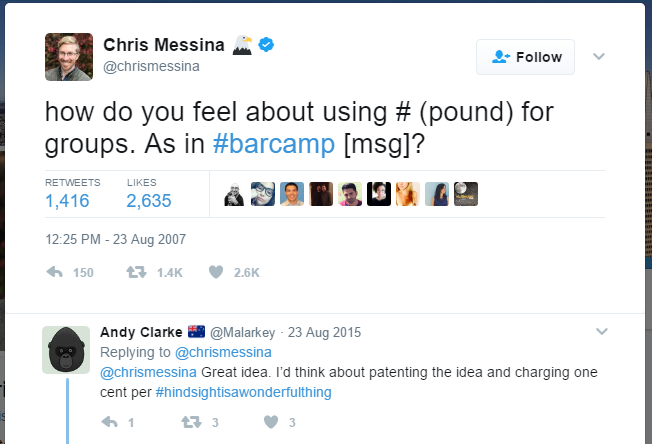 In 2007, Chris Messina proposed implementing the system on Twitter, and the rest, as they say, is history. Hashtags allow users to find your content and are an important part of a viral campaign. If people can easily find posts related to your viral content, they’ll be a part of the critical mass that propels the idea forward. It’s hard to find your first few early adopters. 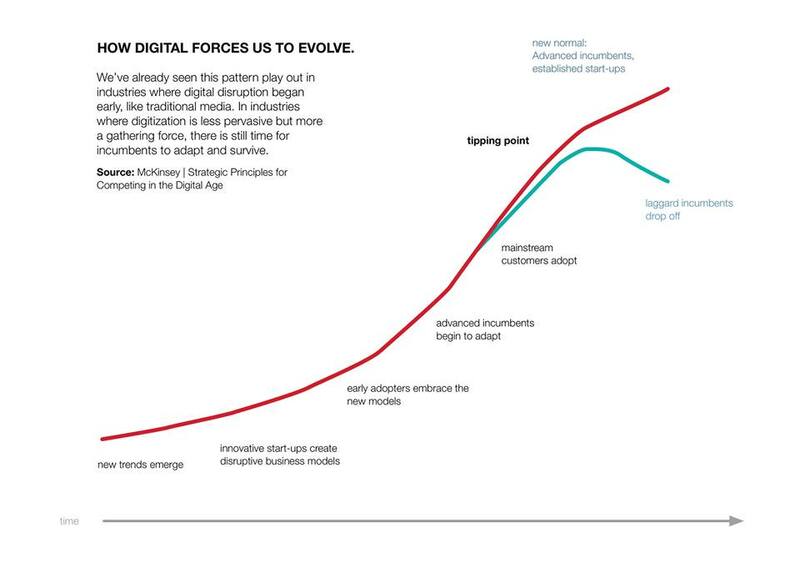 Social trends happen in the same way as digital disruption, illustrated by the graph below. Keep this model in mind when introducing new ideas, and remember that on some level, it is your job to direct the early adoption and help guide your audience to the tipping point. This applies to all marketing efforts, but specifically should be considered as you develop a viral campaign. 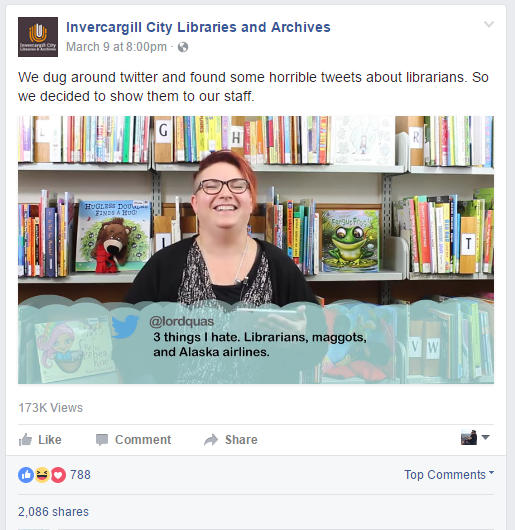 A fantastic example of viral library marketing was done by the fine staff at the Invercargill City Libraries and Archives, who regularly post hilarious parody content. 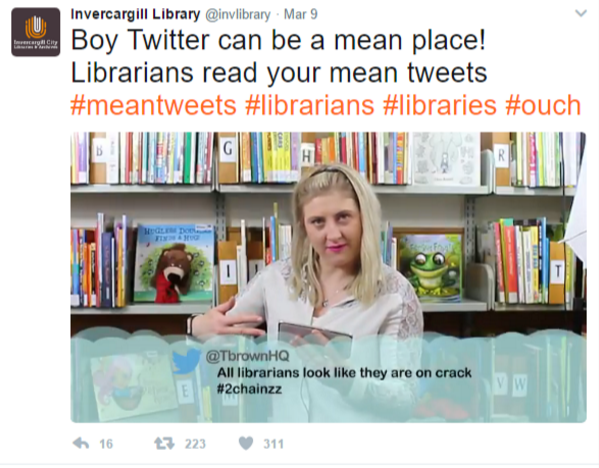 Their recent “Librarian Mean Tweets,” has done very well for itself. Take a look. As of April 2017, this video had 788 likes and 2,086 shares on Facebook; it’s also been liked 311 times and re-tweeted 223 times on Twitter. Because Invercargill didn’t create their own hashtag for the video, it’s hard to track exactly everywhere this content went, but 2,300 shares across platforms isn’t bad for a day’s work! Bravo Invercargill! Of course, this idea was lifted from Jimmy Kimmel Live’s “mean tweets” segment, where celebrities read mean tweets about themselves. Some of these segments have 25 million+ views. First and foremost, video content is the easiest to turn viral. In the two examples we’ve shared, you can see that one version is easier for people to participate in, and therefore its viral-ability is that content is being crowdsourced. The second involves somewhat sophisticated editing and some professional-level camera work and after effects. It might not be as easy for a smaller library to fund such a plan, but you never know what sort of local talent you might be able to recruit to your cause. In the case of the high production value viral content, playing off an existing idea can be incredibly effective. It won’t involve your community as much, but it can get your library attention—attention which you can direct where you’d like (i.e. library card sign-ups, events, programs, etc.). While videos are cheap, accessible, and fun, they’re not the only way to go viral. 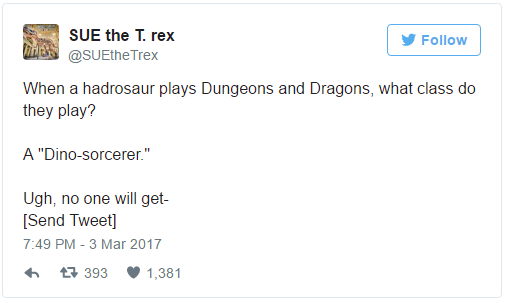 In early March of 2017, SUE the T-Rex of the Chicago Field Museum, inadvertently started a game of Dungeons and Dragons on Twitter, much to the delight of the internet. This earned SUE a lot of engagement and notoriety. At the end of the day, incorporating psychology, developing a campaign that asks other people to be involved, and tapping into familiar concepts (ALS Ice Bucket Challenge, Mean Tweets, Dungeons and Dragons) are all key components to going viral. Creativity doesn’t come naturally to everyone, so tapping into and adapting existing ideas is a great place to start. Your organization, no matter how big or small, could launch a viral marketing campaign–it just requires a lot of thought and pre-planning in order to be successful. In general, create a campaign that’s easy to participate in, makes people feel good, and is relevant to your brand. Also make sure the campaign aligns with your library’s overall goals!